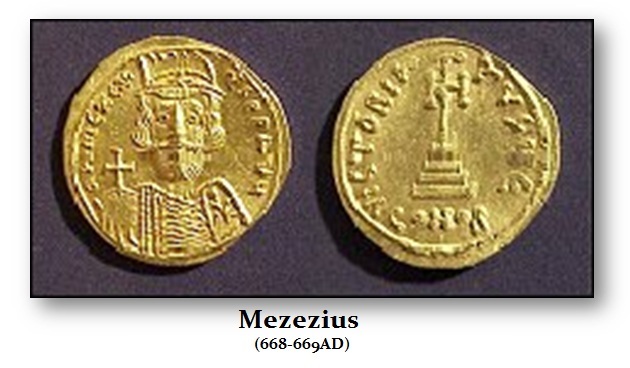 The grand conspiracy which led to the assassination of Constans II included Mezezius. According to the Byzantine chroniclers, Mezezius was an Armenian. According to Cyril Toumanoff, he descended from the princely Gnuni family. Mezezius accompanied Emperor Constans II (641–668AD) in his Italian and Sicilian expedition. When Constans was assassinated in Syracuse, Sicily, in 668AD, Mezezius was proclaimed emperor by the troops reportedly against his will. According to accounts, the Sicilian bishops had pushed Mezezius to rebellion, because Constans had been a heretic for his support of Monothelitism. The historian Michael the Syrian suggested that this rebellion lasted about seven months before it was suppressed. Theophanes the Confessor reports that Constans’ son, Constantine IV (668–685AD), personally led an army to Sicily, where he had Mezezius and his father’s murderers executed.